Heavy duty striker plates that won't bend on you. 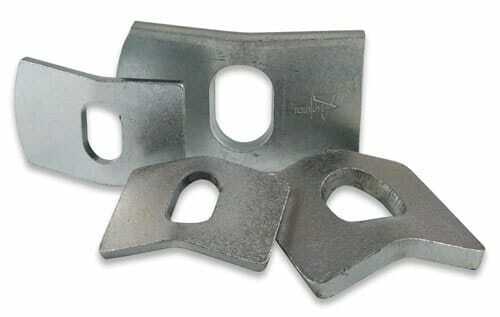 Are you looking for a strong striker plate for your yard? You can trust that your latches will lock into place with our sturdy strike plates. Our zinc plated striker plates are made from quality steel to ensure a sturdy plate that won't bend on you. We supply 14mm striker plates and 20mm striker plates to suit your 14mm latches, 20mm latches or spring bolts. Each plate is angled. As you shut the gate, your latch pin will compress as it moves up the angle. As soon as it hits the hole, the spring shoots in, locking the gate. You can slam your gate fast or hard. If a cow is about to run out the gate, you can shut it and trust that it will lock in and not swing past the post. Single sided or double sided striker plates are available. If your gate operates one way, then a single sided plate is perfect. If you have a gate that swing both ways then your can get a double sided plate. When installing a single sided striker plate, make sure it lines up with your cam latch. This will mean that the plate will be positions slightly to one side of the post or frame. When installing a double sided striker plate, make sure it is centred on the post or frame. Tack your striker plate into place and make sure it works. When you are happy with its position, fully weld it into place.